Vegan snack featuring crisp summer-fresh cucumbers and tomatoes. Use your favorite store-bought hummus or make your own. Slice cucumber into rounds. Thinly slice tomatoes crosswise. 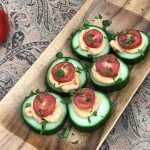 Top cucumber slices with hummus and tomatoes. Sprinkle with parsley. Use whatever hummus you happen to like. You can also try making your own Buffalo Wing Hummus (meatless) or Artichoke Hummus. I found some mini San Marzano tomatoes that made perfect-sized slices. If you use grape tomatoes or cherry tomatoes, it may work better to cut them into halves or quarters. English (or hothouse) cucumbers are the long ones that come wrapped in plastic. I like them because their skin is thinner and they have fewer seeds than regular cucumbers.